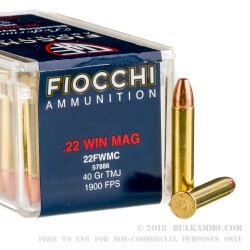 A genuine bargain for the 2000 round case lot of 22 WMR ammunition by Fiocchi. But what else did we expect from Fiocchi, if not a genuine bargain? 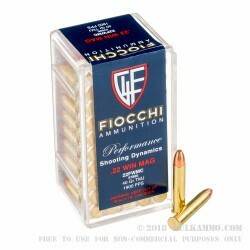 The delivery of every product at an astonishingly low price relative to peers for newly manufactured ammunition has been a big part of the success of Fiocchi in the American shooting market. They have, as a result, built a very good reputation for producing top tier ammo for a song. 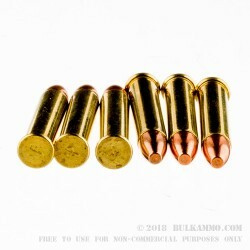 The .22 Magnum rounds featured here are loaded with 40 grain total metal jacket projectiles with a unique profile shape and design that is purpose-built for the .22 WMR (Winchester Magnum Rimfire) and offers significant hunting performance for those who don’t want to move to a centerfire round for their needs. The potent load offers a shocking 1900 feet per second velocity and 321 pound feet of energy at the muzzle, making this price point an even more interesting proposition. The great static ballistics offer you a lot of flexibility in the field or on the range and at the price - this is suitable for both endeavors.